Daniel Gordon (1980, Boston, USA) is known for his colourful, patterned photographs, portraits, still lifes­, and photographic abstractions printed on canvas: so-called Screen Selections. 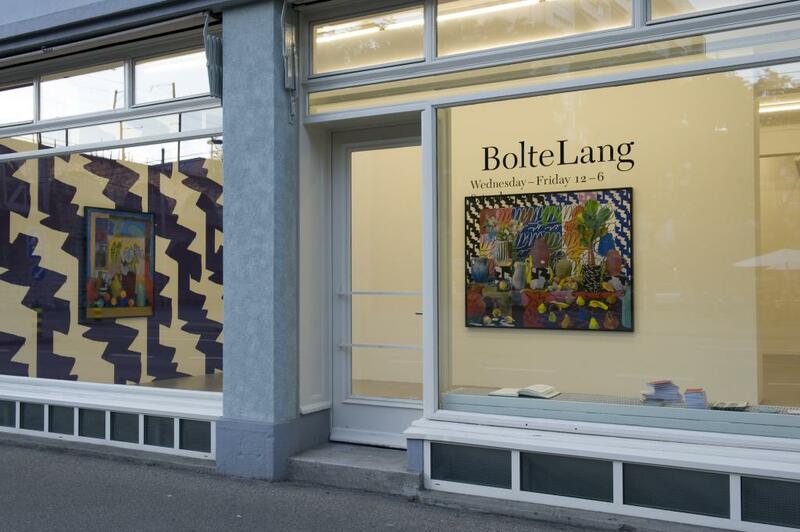 In his first solo exhibition at BolteLang Gordon will present a site-specific wallpaper installation alongside new still lifes and screen selections. Gordon’s still lifes include classic subjects such as vessels, fruit, plants and vegetables. He culls photographic images from the Internet, combining them with his own digitally drawn motifs, and uses them to build three-dimensional tableaus, which he then photographs with an 8 x 10 view camera. After the photograph is taken, the sculptures are dismantled and background patterns are re-used to make new works. Using a manual cut-and- paste technique, Gordon builds forms that expand upon the rich history of collage and appropriation, while also nodding to the long lineage of the painted still life (Matisse’s colourful arrangements, Wiener Werkstätte textiles, Cézannes still lifes, and digital artifacts come to mind). Gordon’s subject matter lies in a series of binaries that frequently coexist in his photographs: Wholeness and fracture, analogue and digital, classical and contemporary. These dualities are underscored through the process itself: torn edges are left raw, forms fuse and separate, teetering between completion and dissolution, machine and man. The wallpapers appear for the very first time in Hand, Select & Invert Layer and are based on background elements in his photographic works. The exhibition was initiated and curated by Claudia Groeflin Ziltener. Daniel Gordon (born 1980 Boston, MA, raised in San Francisco, CA, lives and works in Brooklyn, NY) earned a Bachelor of Arts from Bard College in 2004, and a Master of Fine Arts from the Yale School of Art in 2006. Daniel Gordon’s work is part of the collections of The Museum of Modern Art and the Guggenheim Museum in New York.